This large survey of 24 works will be presented across two venues, with the Nathalie Karg Gallery (291 Grand St, New York) featuring paintings made in Paris in 1952−53. Cheim & Read’s exhibition covers the years 1954 to 1959, after the artist returned to New York and moved into a studio on East Broadway. The exhibitions will run at Karg from May 2 to June 15, and at Cheim & Read from May 17 to July 6. 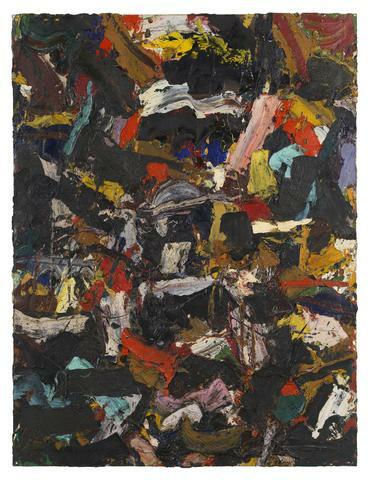 The Paris Paintings at Nathalie Karg are richly dark works with ripples of white, blue, green, rust, and red running horizontally across their heavily worked surfaces; one exception — a mosaiclike patchwork of earth tones, dark greens, and reds from 1953 — provides a bridge to Held’s approach after he returned to New York. As the debut works of a major American artist, Held’s sensual, mysterious, and dynamic Parisian nocturnes are emblematic of the restlessness and audacity that would become hallmarks of his career. The gallery will host a panel discussion on Wednesday May 30, 6-8 PM. Panelists include: David Cohen (moderator), Keltie Ferris, Matthew Israel and Nathlie Provosty.